Here on our homepage, we’ve put together in-depth reviews of our favorite sprayers for general use. If you have a more specific need, like painting cars or working indoors, check out our specialized guides! There are links for all of those pages below. Our home page also features a helpful guide to deciding which type of paint sprayer (and which model specifically) to buy! You can find that just below our reviews. Let’s get to work with a glance at our Top Three! Why should you be using a paint sprayer? To start, these things are 10x faster than using a brush. You can get your work done in a fraction of the time using a sprayer! They’re much more effective at painting tight spots and uneven surfaces evenly, and they can create smooth finishes that brushwork can’t even touch. The tricky thing is that there are all different sorts of sprayer systems out there, from guns to use with air compressors, to airless machines with pumps and handheld units for small projects. To a DIYer, the whole market can be confusing. It’s hard to know how much to spend, or what type of sprayer you need to work on each kind of project. For professionals, shopping is often just as time-consuming and frustrating. Given the vast range of options, the differences between pro-grade and DIYer-scale machines aren’t always clear. We’ll introduce you to the best models in each category, and help you figure out which paint sprayer or sprayers should become part of your tool kit! This HomeRight handheld unit is currently our favorite hand sprayer for folks working on small projects. It’s affordable, it does a good job on most coatings, and it’s easy to use if you stick to the instructions. We recommend this one to DIYers who are working on cabinets or other furniture. The HomeRight is entirely self-contained, and it’s the only piece of equipment you’ll need to get painting. It’s one of the most affordable HVLP units out there. The HomeRight is available for less than $75, which makes it cheaper than a lot of nicer paints! HVLP sprayers have traditionally been much pricier, but this is very reasonable even for only occasional use. You can learn more about why we prefer HVLP sprayers indoors in our Buying Guide. In this case, suffice it to say that the HomeRight is more accurate, consistent, and efficient than other hand models thanks to the HVLP design! It sprays just about anything, as long as you thin your coatings accordingly. You can get good results with deck stains, furniture varnishes, or even latex paints, so long as you water them down per the instructions! Previous buyers report good results with all manner of coatings, albeit in smaller applications. This one comes with a viscosity cup and tool for working out the right balance. It also has built-in filters to keep the sprayer tip from clogging on thicker coatings. It’s more versatile than other inexpensive handhelds. While a lot of other models can theoretically spray the same range of coatings, the HomeRight has more adjustments to help you cater the machine to each application. You can adjust the flow pressure with an easy knob, so that you can change quickly from latex to stains, say. There are also three spray patterns to choose from: horizontal, vertical, and circular. It has a brass needle and spray tip. That’s the mark of quality on a sprayer gun, and it’s the real test for a budget model. Since the HomeRight has brass parts, it works more accurately and consistently over the long term. It’s also much easier to keep clean! It’s just over 3 pounds, not counting a cup full of paint on top. That’s heavier than a more expensive unit, since you’re holding a small pump in addition to the actual gun itself. However, it’s a good deal lighter than other all-in-one handheld models out there! It comes with a cleaning brush to keep the spray tip clear of buildup and clogs. There are also a few helpful accessories to make painting easier. One is a viscosity cup to assist in diluting paint. You also get an air spray nozzle which converts the sprayer into a makeshift air compressor. It’s a handy mode for dusting old furniture before you paint. It’s a cheap hand sprayer, and you should know what that means. It’s less precise than a full-size HVLP system with an independent spray gun. It’s not something we’d recommend for a car, for instance, where you need a pro-grade finish. It’s also simply not built for frequent, intense use. If you’re doing more than the occasional painting process, look at one of our more expensive recommendations. People who tried to use this for more ambitious projects, or for regular use, reported overheats on occasion, and trouble with units that sprayed automatically without them having to pull the trigger.The gaskets are also cheap and sometimes leak if you don’t lubricate them properly. One of the downsides of a less precise handheld unit like this is it produces a fair amount of overspray. You’re going to end up using a good deal more paint than you would working by hand, and you’ll need to be careful to cover anything nearby. It’s not made for regular use or big projects. This one simply doesn’t have the power or the build for doing whole walls, for instance. The most we’d expect this one to handle is a deck (stained) or a fence. You really need to thin your thicker coatings, especially latex paints and the like. A lot of buyers reported running into trouble with clogs and splutter, but that’s common with entry-level models where users don’t always have a great sense of how to thin. The HomeRight comes with really good instructions, and we think that as long as you pay attention to them and follow their ratios for thinning, you’ll be fine. Cleaning is also essential, just like on a more expensive machine. It’s pretty easy with the HomeRight, but if you’re doing a big project, you probably want to do it a few times throughout your spray time. This Campbell-Hausfield spray gun kit is our most affordable recommendation for folks who already have an air compressor, and are looking to equip it for painting. It comes with two well-made, ergonomic guns that offer a lot of value to even ambitious DIYers. You get a larger coverage gun, and a smaller gun for detail work. Both of them have their own cups, adjustment valves, and all the other accessories to cover a range of projects. It all fits in a simple case, and costs well under $100! There are a lot of things to love about this Campbell Hausfield kit, but the price has to come in at the top. This is a kit that you can usually grab for $75 or less, which is fantastic value for a set of two good-quality guns. Throw in the accessories, and we think you’ve got a real bargain here. It’s an affordable way for people with good air compressors to branch out and make their shops more versatile! Both guns are solid performers. They’re HVLP designs, with gravity feed cups which maximize your paint usage. You won’t be wasting any in the cup with the Campbell Hausfield guns! They atomize extremely well, and lay down very smooth coatings of all kinds, provided that you do the work of thinning them accordingly. We think they’re ideal all-purpose sprayers for furniture projects, indoor walls, and even cars (with enough skill). They’re the perfect set for someone who is getting started with painting and wants to try their hand at a variety of projects. These are fitted with 1.4mm all-purpose tips, but you can always change them as need be. The larger spray gun draws 2.1 CFM from your compressor, running at 40 PSI. You should be fine to run this on a relatively inexpensive, DIYer’s air compressor with no issues! Some other big guns draw too much air to be run off a DIY-grade unit. It has a 550ml paint cup, which gives you a decent amount to work with without making for too heavy a tool. You can adjust the spray pattern between 1.5 and 9 inches. This is the coverage gun in the kit, so it’s meant to work on a wider spray width. The smaller detail gun draws 0.7 CFM, and has a much smaller range of spray widths. You’d use it for detail work, in tighter spaces. We love that the gun itself is more compact, so it’s easier to fit in tricky spots and to move delicately. One of the best features about both guns is that they come with pressure regulators, so you can be sure to have an even supply regardless of your compressor cycles. Some compressors can be a bit finicky, so the regulators take any spikes in pressure out of the equation. That makes for a smoother, more consistent paint supply. They’re both gravity-fed, which means that the cup is below the nozzle. That’s the reverse of the HomeRight. We like gravity-fed guns because they tend to get more paint out of the cup, since it’s all flowing downward. Like the HomeRight unit, these Campbell-Hausfield guns are quick and easy to clean. Everything in the set is covered by a 1-year warranty! Unlike more expensive Campbell-Hausfield equipment, this gun set isn’t made in the USA. That’s not a huge surprise given how affordable it is, but it’s still disappointing given the brand’s reputation as an American manufacturer. With all that said, we haven’t seen any complaints about quality control or durability with this imported set. The cups in this kit are plastic. They can potentially crack, which is why we prefer metal cups. At this price, though, we don’t think it’s much to worry about. You’ll need a compressor and a hose to use these spray guns. If you already have a compressor, make sure it can easily supply at least 6-8 CFM at 40 psi or more. If you’re buying one, check out our guide (links below). They’re not as precise or smooth as a Fuji gun or a high-end car gun. They’re also not built as ruggedly. So, while we think these make a capable starter set for DIYers, they’re not something we’d recommend to advanced painters who can afford to spend more. They won’t give you quite the professional quality that a Fuji gun like the one below would. This Fuji gun is our top choice for all-purpose paintwork. 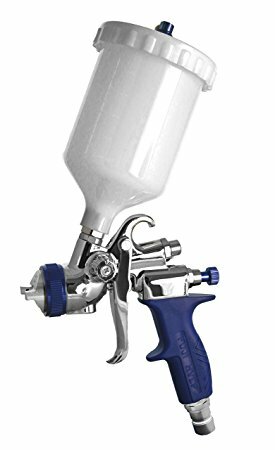 It’s a professional-grade spray gun with lots of finesse and a lightweight, user-friendly design. 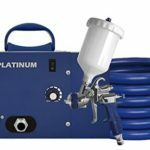 While DIYers probably don’t need to spend this much on a spray gun, the Fuji more than justifies its cost with all the little features and conveniences a regular user will appreciate. It’s versatile, rugged, and highly ergonomic. If you’re looking to add to your HVLP turbine with a top-quality gun, go with this one! It’s a gravity-fed gun like the Campbell-Hausfield’s. With the top-loading paint cup, Fuji will help you get the most out of each cup of paint. A lot of users noted that the Fuji markedly cut down on their waste paint, even compared to other gravity-fed guns! It has better atomization than the Campbell Hausfield’s. That’s because the tip and needle assembly is machined more precisely. This one produces glass-like finishes and very even coatings that don’t have any visible blemishes. It’s ideal for people who make their money using spray guns, since you can depend on it to create perfect coatings! This is truly a professional grade sprayer. It’s loaded with a new high-efficiency air cap which delivers its superior atomization and sputter-free performance. It has very, very little overspray, even compared to other HVLP guns, and the consistency of the spray is great for gloss finishes as well as plain paint jobs. It’s even good enough to spray cars! The all-purpose 1.3mm tip that comes standard does a great job on most coatings. You can use it for paints, stains, or lacquers, provided you follow the thinning chart in the manual. To switch precisely between them, there’s a simple inline pressure adjustment. 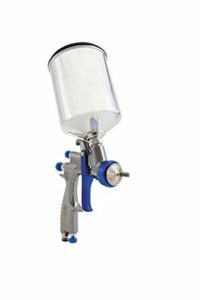 These T-series guns are designed to be more slim, ergonomic, and arm-friendly than standard spray guns. This one is very lightweight, and it also feels balanced thanks to the cup placement. The whole thing is less than 2 pounds! The Fuji is ideal for people spraying for hours at a time, or folks who work with their gun every day. At the same time, the Fuji still feels sturdier than the Campbell Hausfield’s and other less expensive guns. It’s almost entirely metal, aside from the filters and the grip material. The knobs, tips, and all the fluid components are 100% stainless steel. This is a gun that will last for years, as long as you keep it clean. First off, it has a patented non-bleed design. In layman’s terms, that means that it does a superb job at controlling overspray, and prevents shop dust blowing around as much. You’ll waste a lot less paint with this than you would using the Campbell-Hausfield’s or even a set of Graco-Sharpe’s. It also has a special grip on the handle which stays cooler as you work. That’s good for keeping your hands from slipping with sweat, and it’s better for the gun components. The convenient side control knob makes it fantastically easy to adjust fan size. Users were very pleased with it, and most agreed with us that the spray pattern control is one of the smoothest and most precise out there. It moves very surely, but never feels loose or wobbly. Overall, the quality of the machining and engineering on this gun shows in how much less sensitive it is to changes in pressure and viscosity than other guns. Even with regulators and filters, a lot of other expensive guns can still give you grief. This one sprays extremely smoothly and reliably. The 600cc cup is large enough that it provides a lot of angle options as you spray. If you prefer something else, there are also 3 other size options available! Extra tips are also very affordable compared to other high-end gun parts. In short, this is an easy gun to modify and customize. Reviewers agreed overwhelmingly that no other guns save DeVilbiss auto sprayers could compare to the control and consistency the Fuji offers. It complements a painter who really knows what they’re doing! Fuji is a Canadian company with excellent customer service. They’ll troubleshoot issues with you, and previous buyers were especially impressed with how quickly the company responded to inquiries. The manual also has a very helpful section full of troubleshooting tips, thinning charts, and other advice. It’s covered by a 2-year warranty, and made entirely in Canada. It’s designed to be used with a HVLP turbine sprayer, so you won’t be able to use it with a standard air compressor. This is definitely for folks who already have a pro-grade or high-end DIYer’s turbine setup. You have to clean everything carefully for the best results, including the seals. That’s true of any high-end gun. However, the seals on this one can definitely get leakier than others when they get paint on them. Keep them greased and clean them well! It’s pretty expensive. While the Fuji isn’t the most expensive gun on the market, it’s still over $300. That’s a hefty price tag for a DIYer, especially when you consider the cost of the HVLP sprayer you’ll need to drive this gun. However, we think it will pay for itself in situations where it will be used regularly, especially for pro shops. You wouldn’t want to use this for outdoor latex paints, or other super thick coatings on large surfaces. It’s more of a fine-tuned tool for jobs that require finesse. So far, we’ve only looked at HVLP systems. They’re great for control, efficiency, and precision. However, when you need to cover lots of ground fast, and are using thicker paints, what you want is an airless sprayer! These systems have lots of grunt power, and the ability to spray paint by the bucket to get large jobs done easily. 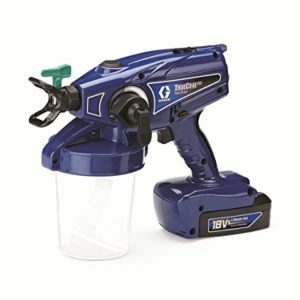 Our favorite airless model for the DIYer or handyman is the Graco Magnum X7. It’s not part of the company’s professional lineup, but it offers a lot of power and versatility to ambitious DIYers or light pro users. This is an excellent choice for re-painting your whole house, or for folks who do small to medium paint jobs every so often. It’s inexpensive. While the X7 is hardly the cheapest airless sprayer on the market, it’s still available for less than $400. One reason we recommend it over the X5 is that there’s relatively little difference in price, for a sizable (15%) improvement in power and capability! The X7 is a much better bargain in terms of the power and build you get for your money. It’s heavier-duty, and it comes mounted on a cart! We also think it’s the better choice for folks who are planning to repaint their whole house, since it has a higher annual usage rating. Plus, while it’s more expensive than the X5, even the X7 is cheaper than hiring pros. One other key advantage that’s easy to overlook is that the X7 gives you a wider range of tip options than the X5! It comes with an all-purpose 515 tip (1.5mm), and unlike the X5, the X7 supports up to an .017” tip. That’s better for folks working with really thick exterior paints, and other coatings which require the .017” fitting. Out of the box, the X7 is fantastic for all common interior and exterior paints, as long as you thin properly. Most paints can go through un-thinned, if you’re using the higher pressure settings. In any case, it’s ideal for walls and ceilings, as well as general purpose furniture where latex paint is your go-to coating. If you swap out the tips this can also be used for stains. Since it has lots of power and a relatively wide coverage, it’s an easy tool for staining decks, picnic tables, and other outdoor woods. The tips are easy to switch, and relatively inexpensive to purchase in alternate sizes. There are a number of reasons we like this better than the X5, but overall, it comes down to the fact that the X7 is better for midsize jobs. It’s built more heavily, the cart makes it easier to move around, and it has a more powerful pump onboard! 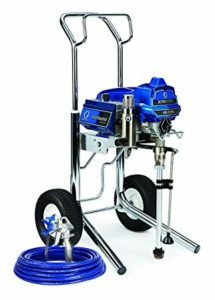 Graco rates this one for quarterly use, serious DIYers, handymen, or light contractor work–anything up to 125 gallons per year. It’s built very well. The X7 is made in the USA, and while it’s not quite professional-grade, it’s well above other DIYer-class products. It has a powerful 5/8 HP motor powering a stainless steel piston pump. The spray gun is metal as well, as is the cart frame. Thanks to the suction tube, you can spray right out of 1-gallon or 5-gallon paint buckets. There’s no need to fill or empty special containers, or to try to fill up the machine. This one really excels with 5-gallon buckets, especially compared to the X5. There’s a hook to keep a 5-gallon bucket moving with you, right on the cart! That makes large jobs much faster, since you can keep spraying without so many starts and stops. The pump has an easy auto primer so there’s nothing you have to do besides set up and switch on. The spray tip (and any replacements/alternate size tips you get from Graco) are reversible. That makes it much easier to clean out any clogs or buildups! The flushing adapter connects to a garden hose so you can easily flush the whole machine without having to fill buckets with water. It’s one of the standout features for us! Being able to use the hose to do the bulk of the cleaning for you means that cleaning out the X7 is faster than cleaning most handheld sprayers, or even cleaning all your hand rollers, brushes and trays! There is an easy dial with graphic indicators to help you adjust the pressure for each job. It’s only 26 pounds, so it’s very manageable to lift when wheels aren’t practical. It sits on scaffold easily, too. The hose gives you 25 feet of range, which is enough to get you around bigger areas while still convenient enough to use indoors. The X7 can support up to 100 feet, and other hose sizes are reasonably priced. It has relatively little overspray compared to other airless models, and the savings in paint costs really add up over big spaces. It comes with handy guides, thinning charts, and even an instructional DVD. Overall, it’s one of the most intuitive machines you can get. An airless sprayer like this isn’t for doing fine furniture work or finishes on cars. It produces much more overspray than HVLP units, and results in not quite as immaculate a finish with lacquers. This is mostly a coverage gun, indoors or outdoors. You’ll need a smaller tip for some coatings, like stains. This isn’t a pro-grade machine. Some buyers tried to use it for multiple houses, or day to day spraying and were disappointed in durability. It’s only rated to 125 gallons per year, which can seem like a lot to a DIYer, but is nothing to most pro painters. Its pump can’t be changed without major repairs, either. So, we recommend that pros go for models with a higher usage rating and pumps which are easy to swap out. Check out our more expensive Graco recommendations below! The hose isn’t long enough for a multi-story outdoor job. You’d need an extension. The gun on the X7 isn’t quite as nice as the ones on the Pro series, either. It’s not as focused as full-pro models, so it results in lots of blowing around. You have to really secure things around the spray area, especially masking. 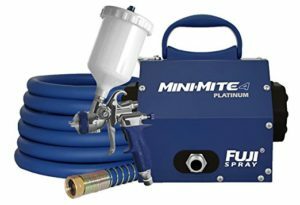 Fuji’s Mini-Mite 3 is possibly the most beloved HVLP spray system on the market. It’s consistently at the top of professional testing charts and bestseller lists. Just this year, it was rated Top Tool and Top Value in WOOD Magazine, and that’s on top of previous Best Overall medals from Fine Woodworking! Well, as much as we love the Mini-Mite 3 for finer applications, we’re recommending a slightly souped up version here as an all-purpose sprayer. The Mini-Mite 4 is nearly identical to the 3, but it has a bit more under the bonnet. This model has a 4-stage turbine motor as opposed to a 3-stage motor, which is what you get on the Mini-Mite 3. That gives you a sizable increase in power, for close to the same price. This is a better all-purpose system for spraying thicker paints as well as finishes. It’ll do anything from entire walls to fine furniture jobs! It’s more powerful than the Mini-Mite 3. With a 4-stage turbine, the Mini-Mite 4 can crank out a full 9 psi. That’s more than enough pressure for any known coatings, as long as you follow the thinning guidelines in the manual. So, although most people use HVLP sprayers for finish work, this one is versatile enough to do every coat (as long as you switch tips as you go). We like the extra power because it allows you to thin less, and paint more efficiently with thick coatings. You also get even fewer clogs. A general rule of thumb with motors also applies here. That is, the more stages, the more regular the output. This system has to work less hard than the Mini-Mite 3 to achieve the same spray. The result is very regular output which is easier on the turbine motor. That makes for cooler operation, and better longevity of the components. This is a super compact system. The turbine is housed in a neat little crate, about 1 1/2 cubic feet around. Since it’s such a tight package, it’s super easy to transport. The motor unit is lightweight, and it has a handle built into the top. With the hose and gun included, you’re still looking at a system that weighs less that 30 pounds! That’s impressive given how powerful, rugged, and reliable the system is. The casing is all metal, and the hose is threaded extremely durably. It’s one of the best we’ve seen! The turbine unit also features a smart heat dissipation box which takes heat from the turbine and redirects it to a ventilated component at the back of the casing. It’s not a feature that’s obvious from the outside, but it allows the whole system to run cooler and therefore last longer without issues. 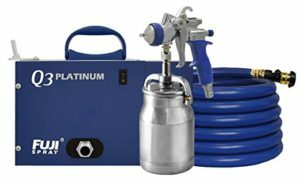 It comes paired with the T-75 spray gun, which we’ve featured as a best-buy in its own right above! You can read our full review of the gun to get a comprehensive take on it. Here, we’ll focus on how it fits into the system. Like the turbine unit, this gun is all-metal, aside from the cup. Rather than cheap plastic, though, the cup is made from nylon. It’s an important distinction. Nylon is shatter-proof, so this one won’t crack like plastic does. Overall, it’s a rugged and reliable gun that will last for years if cleaned properly. There’s a convenient side control knob for making spray pattern adjustments, so you can make changes from the gun rather than having to go back to the turbine unit. It’s lightweight, too, just like the turbine unit itself, and with the “stay cool” handle, it’s comfortable to use on long jobs. The non-bleed channel and cap design makes for a precise, controlled spray pattern. We talk more about the machine quality in our T-75 review, but suffice it to say that it’s superb. There’s very little overspray, and no blowing around your work area. That’s a huge departure than the X7, and even from other HVLP systems. Out of the box, the T-75 is fitted with a 600cc gravity-feed cup and 1.3mm standard all-purpose cap set. You’ll be able to start spraying most finishes out of the box, and with the right thinning and tip set, the Mini-Mite 4 is good enough for fine finish work on cars and furnitures, even if it’s not quite as superb as the Q5 system for varnishes, lacquers, and clear coats. The set comes with a 25-foot hose and quick-connect couplings between the turbine, hose, and gun. Everything’s made in Canada, to a very high standard of quality control. You won’t find any complaints about durability, reliability, or quality with this set! It’s covered by a 2-year warranty, and excellent customer service. While it’s no louder than other HVLP’s, it doesn’t have any specific noise-reduction features. If you’re worried about noise, you’ll want to look at one of Fuji’s Q-series models. We’ve recommended one below, and you’ll also find a few in our HVLP guide. Some users might be less than thrilled to see that this doesn’t have a metal cup. Nylon is extremely durable, but still feels less professional. It’s not quite as good as the Q5 in several departments. It’s louder. You also can’t adjust the turbine output–you can only tweak the gun. The Q5 gives you more finesse Our take: the Mini-Mite 4 can give you a very good finish on all types of coating, but the Q5 can deliver knockout results on every project. We recommend the Q5 only to professionals who will actually be able to appreciate and make use of the differences, but they’re worth noting. Even the Mini-Mite 4 can be a bit pricey for DIYers. We don’t recommend this to anyone who’s not going to use it on a regular basis and for projects where the quality of the finish will really show. It’s a better choice for ardent DIYers and pros. If you want the absolute best of the best for your HVLP system, the Q5 is as good as it gets in our book. It’s ultra-quiet, super-powerful and infinitely versatile. The price alone will put it out of range for most people who don’t make their living painting or finishing professionally, but for those who do, or for DIYers with plenty of cash, we think it’s the ideal workhorse. This is Fuji’s flagship model, and we’re confident that it’s the absolute best HVLP system on the market right now! It’s even more powerful than the Mini-Mite 4, thanks to the 5-stage motor! This Fuji can crank out up to 9.5 psi, which outstrips anything else on the market. Of course, HVLP’s aren’t all about brute force. Still, having a higher power rating makes this much more adept with thick coatings than other systems. Since it’s so powerful, it’s the best HVLP out there for latex. With any coatings, it gives you the fastest possible HVLP application with the least thinning necessary. The extra power also provides the finest atomization of any sprayer system, period. That’s why the Q5 is better for varnishes, clear coats on cars, and so forth. The best thing about the Q5 is that it combines ample power with superb control. Unlike the Mini-Mite 4, the Q5 has a precise speed control knob on the turbine itself. You can actually adjust the output of the sprayer, not just the gun itself! That gives you precise psi/cfm control to get the optimal setting for each coating and project. So, the Q5 can give you stellar results on absolutely anything from lacquers to latex! Having such a fine degree of control also reduces overspray and bounceback. So, you’ll lay on cleaner, more precise coatings, while using your material supply more efficiently. Simply because of the extra controls, the Q5 can save you even more waste than something like the Mini-Mite 4, which is already very efficient. If you’re a pro buying this model, you’ll find that over big jobs, the Q5 can save you a lot of money through conserving coatings. When you’re looking at expensive auto paints and high-gloss lacquers, that can add up fast. Between the atomization and adjustments, it gives you absolute precision and control. While the Q5 is probably overkill for general painting, in fine applications the difference will be very apparent to the trained eye. Professionals rave about the control you can get with this one. That’s why it’s our top recommendation for cars and high-end furniture work! Since it can handle absolutely any coating with precision (as long as you thin and use the proper tip), this is the most versatile sprayer on the market right now. It’s good for small to whole-house projects. It’s still compact, and the Q5 is actually the same size as the Mini-Mite 4! It weighs a bit more, but is still a reasonable 32.6 pounds all told. It’s built to last through frequent, intense use. The Q5 features the same all-metal casing as the Mini-Mite 4, and the hose/gun set are just as rugged. It also has the same proprietary heat dissipation box. That redirects heat away from the turbine and out of the housing, resulting in even longer life for the turbine system. Plus, it’s completely silent cooling! As with the smaller 4-stage model, the Q5’s heavy-duty metal casing with a gun holder and handle built in. It’s a much quieter system than the Mini-Mite 4. As part of the Fuji Q-series, the Q5 has noise reduction features and mufflers built into the casing. It’s rated to put out 63 db at 15 feet, or 60 db (or the level of a normal conversation) at 20 feet. For comparison, that’s about 50% of the noise level you’d get from a standard HVLP! It comes with the same T-75 gravity-fed gun as the Mini-Mite 4. Again, we’ve gone into detail in our review of the gun itself, which you can find above. Here, suffice it to say that the T-75 gives you fully incremental fan adjustments, which complements the controls on the sprayer console very nicely. It features a tight, precise, non-bleed 1.3mm general purpose cap that’s good for all-purpose work. Tips are affordable and easy to change. It’s lightweight and highly ergonomic, as you’d expect from a top-of-the-range tool. As with the Mini-Mite 4, the Q5 comes with a 25-foot hose with quick-connect fittings. Like the Mini-Mite 4, it’s made completely in Canada, and covered by a 2-year warranty and superb customer service. The only real downside to the Q5 is the eye-watering price: it costs more than $1300! Of course, to a working pro, that’s not terribly expensive at all. In fact, given the precision of the system and its versatility, it’s a very respectable value. However, the high cost will put this out of reach for most DIYers. Aside from the price, there’s really nothing not to love about this system. It’s the best HVLP spray system on the market right now! If you’re a professional painter who paints whole houses regularly, there’s no debate in our minds that the Graco Ultra Max II 495 is the ultimate sprayer. It’s an airless system much like the X7 we’ve reviewed above. However, it’s souped up to be an industrial-scale, professional-grade piece of equipment. This is the second-largest system Graco makes, but we think it’s more than enough for most pros. We think you can save hundreds of dollars over the next model up by using this, and also end up with a more manageable system. It’s one of the most powerful airless sprayers on the market, period! The 495 packs a massive 1.2 HP motor to power its pump assembly. That’s wildly more powerful than any of the other systems we’ve recommended. It can crank out .6 GPM on the highest settings, which means you’ll be getting your work done fast! There’s only one Graco model above this, and we don’t think it’s necessary for most buyers. That model is hundreds of dollars more expensive, and it’s too big and bulky to manage unless you only work in industrial settings. This one is the best you can do under $2500, which is the max we think you should have to pay for a sprayer! It’s also a better balance of power and portability! The 495’s gun and pump system is designed to support up to a .025 tip size, so there’s absolutely nothing this thing won’t spray. It can easily handle primers, stains, enamels, and latex. Plus, you won’t have to thin much at all. The 1.2 HP motor is brushless, which makes for a longer-lasting, lower-maintenance drive system. You won’t have to change out brushes at any point, since there aren’t any to begin with! Its hardened steel gears run quieter than other drivetrains, and the high-ratio gear reduction results in slower pump strokes and longer life on each pump. It’s also wired for DC operation, since DC power is less affected by fluctuations than AC current. When you’re working off job site generators, that’s super important. Having DC stability results in a pump system with fewer changes in pressure or output. You’ll need at least a 3750W generator for this one, or a suitable ground hookup. The 495 runs on either standard or industrial power, so you can get it running pretty much anywhere as long as you’ve got the wattage to back it up. It’s rated for professional use, unlike the X-series Graco’s we looked at above. This one is designed to spray up to 100 gallons per week, and can support up to a whopping 100 feet of hose! The 495 has a very durable “Endurance” pump, which Graco claims lasts twice as long as the competition. While it’s hard to test that objectively, the vast majority of reviewers who use these things professional swear by them. They’ve got a great track record in real-world use, which isn’t true of a lot of the competition. The Endurance pump features V-Max blue packings, Chromex rod, and a hardened stainless steel cylinder, all of which are best-in-class components. The easy-access intake valve makes for quick cleaning and easy clog removal. In fact, you can easily get access to the whole pump! That’s because they’re designed to be removed and replaced. You can even swap out the pumps on the job when one fails, and the whole thing takes less than a minute. So, it’s easy to get replacements and keep a few on hand, then, send the bad pumps for repairs when needed! The replaceable pump system won Graco an award from protoolreviews.com for their innovation! It’s one of the best design ideas we’ve ever seen for professional painters. The pump filter lifts out vertically, in a convenient tube. That makes for fewer spills and drips than typical horizontal filters. This one has also been tweaked to filter from the inside out. Since it filters from the inside out, it won’t collapse like other filters. This one comes standard with a 50-foot hose, so you can tackle big jobs right out of the box. The 495 is as smart a system as it is strong. It has an onboard computer which manages the flow, and a display showing pressure, gallons, hours used, and other error messages and diagnostics for the system. It tracks usage time and gallons for maintenance, and is ideal for pros who are managing a fleet of sprayers. The system can tell you how many gallons you’ve sprayed over the machine’s working life, and it has a resettable counter so you can keep track of material usage on each job! It’s paired with an excellent gun: Graco’s all-metal contractor gun. It’s durable, versatile, and more ergonomic than other airless sprayer tools. Out of the box, the 495 comes with a 517 switch tip and guard. It’s reversible, so you can easily clear clogs. However, between the size of the tip and the power of the pump, this is pretty hard to jam. It’s an excellent all-purpose gun/tip combo for latexes and typical house paints, as well as stains and oil-base primers. You can also buy a few different tip sizes to help adjust for different projects and surfaces. It’s easy to move around, unlike a lot of big, pro-grade units. We’re recommending the cart model, which allows you to roll the pump around with a 5-gallon bucket attached. It draws from the bucket through a flexible suction hose. It has thick, grippy tires that handle well on job site terrain as well as indoor settings. Flow-through cleaning allows you to hook up a hose and clear the system with just a few gallons of water! It’s one of the best features on Graco airless systems, and it makes a world of difference when you don’t have to keep filling water buckets to clean out your sprayer. That cuts down on cleanup time massively, and so does the fact that the motor has a special cleaning setting to make water go through super fast! It’s all made in the USA. That’s something you want to be able to expect from professional-grade tools, but even some of the competition at this price point are cutting corners and outsourcing manufacturing. The 495 gives you the quality control and durability that comes with equipment made in the USA. It’s prohibitively expensive for most non-professionals. At close to $2500, the 495 is definitely overkill for anyone who isn’t painting large areas on a regular basis. We recommend it only to professionals who will make full use of it. This is a loud, loud unit. It puts out around 90-100db, measured per ISO-3744 requirements. That’s many times louder than any of our other picks, and it’s something to take into consideration. The long hose means you can easily park this outside or several rooms away when you’re painting indoors. Still, it’s going to make quite a racket, and you absolutely need good ear protection to use it. At 66 pounds, it’s on the heavier end of things. Once you add a full 5-gallon paint bucket into the equation, you’re looking at a pretty hefty assembly. Alright, now that you’ve seen all our recommendations in detail, let’s quickly review what we’ve seen, and help you sort out which sprayer is your best buy! The HomeRight is the obvious choice for folks who are working on smaller projects and DIY tasks and don’t already have an air compressor. It’s simple, affordable, and does a decent job with most coatings. Don’t try to do big jobs with it, though. If you’ve got an air compressor that can handle a paint gun, we’d recommend spending your money on the Campbell Hausfield guns and giving yourself that extra versatility, precision, and reliability. 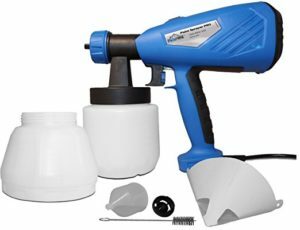 The Campbell Hausfeld Gravity-Feed Spray Gun Kit is what we’d recommend to people who want to start painting and already use air tools in the garage or shop. You’ll need a good compressor to run them from, but they’re fantastic guns for the price. Between the two, you’ll be able to tackle finish projects and coverage projects very well. With all that said, you shouldn’t expect professional-grade results from guns as inexpensive as these. If you’ve already got a good HVLP turbine and are shopping for a gun, we think the best on the market today is the Fuji 5175G. It’s as efficient as you’d expect from a gravity-fed tool, and it’s designed with lots of clever touches that experienced users will appreciate. It’s precise enough for cars and fine furniture work, but your results will depend on the HVLP system you hook up to. It’s also worth repeating that you can’t use this gun with a standard air compressor. For folks who want to cover lots of ground without breaking the bank, the Graco Magnum X7 is our go-to recommendation. It’s easy for DIYers to use, but it’s closer to a professional-grade tool than any other airless unit we’ve seen for less than $500. We think this is the ideal system for people planning a re-paint of their whole house, or for regular DIY projects. Don’t expect it to hold up to commercial use, though. This is only meant for 100 gallons or so per year. It’s also not a tool we’d recommend for fine finish work. The Fuji Mini-Mite 4 is our recommendation to DIYers who are working on projects that require a high-quality finish, like furniture or auto work. It can cover ground as well as the X7, but it also excels at varnishes and clear coats. We think it’s by far the best thing under $1000. However, as impressive as the Mini-Mite 4 is, it can’t compete with the precision control and quiet operation that you get on the Q5. The Fuji Q5 is the best HVLP system on the market as far as we’re concerned. We recommend it unreservedly to professionals who need fine finishes and impeccable coats as well as power. It’s efficient, precise, and very quiet. It can also spray absolutely anything you need it to. While it’s prohibitively expensive for most DIYers, you may be able to justify the cost if you’re a serious hobbyist working on classic cars or restoration furniture. The Graco Ultra Max II 495 is the no-brainer choice for full-time, professional painters who need to cover lots of ground. It’s not a tool for fine finish work on cars or furniture, but it’s the best on the market for walls, borders, decks, and other big projects. Don’t buy this one if you’re a DIYer, though, since it’s overkill by a long shot. The cheapest way to get painting is to buy an all-in-one handheld sprayer. They’re a lot like a power drill, with a hand grip, small motor and gun-style spray tip. Handheld sprayers might seem like toys when you look at one next to a full turbine setup, but they have their place. DIYers who are painting small projects with a variety of coatings will find that handheld units can give very decent finishes, as long as they’re used carefully and with properly thinned coatings. You could re-paint all the cupboards in your kitchen with one of these, for instance, or restore a favorite furniture piece with a smoothness you can’t get using brushes or rollers. The more expensive models can handle thick paints like latex, but most cup guns are intended for more refined or thinned finishes. They’re only for small projects, though. They’re not tools you should use for entire walls, or for more than the occasional project. It’s also worth noting that while a careful user can achieve a good finish with lacquers using handheld sprayers, you shouldn’t expect professional or auto-grade work to come out of these things. The cheapest cup guns sputter or jam on thick paint, because they don’t have the proper pressure to maintain flow. We’d advise professionals and more regular DIYers to look at a full spray system instead of a handheld unit. This is the best choice for people who already use air tools, and have a substantial air compressor available. The best air compressor and gun sets can rival HVLP systems in finish quality, and since you can use the compressor to power all your other tools, there’s a lot of value to be had here. However, if you don’t work with lots of air tools, and if your sole interest is in painting, you’ll probably be better off with an HVLP system or an airless sprayer. 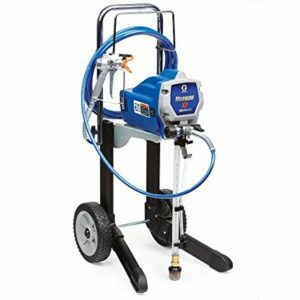 Since most of the air compressors that are powerful enough to supply a paint gun will be stationary or exceedingly heavy, this approach is more suited to those who work out of a shop than those who need to take their equipment all over a house or to job sites. Complete spray systems come in two types: airless or HVLP. The differences are pretty substantial, and luckily, they’re easy to choose between in most cases. Airless systems are generally the best approach for un-thinned paints, especially latex house paints. While some of the most powerful HVLP systems can spray latex well, they’re much more versatile, so people mainly painting houses should go airless. Airless systems are the best at providing fast coverage, for walls, ceilings, and decks. However, while they do achieve good atomization and precision, they create a lot of overspray, and they’re not a tool for doing fine finish work. You’d never want to use an airless sprayer system for auto paint, or for lacquering furniture, for instance. Pro Tip: It can be tempting for ambitious DIYers to buy the most powerful airless sprayer system they can afford. We get it. You want to be prepared for any project. A word to the wise, though–airless sprayers are not to be trifled with! They are extremely powerful, and will pierce the skin if you lose control of your gun. That can result in an injection wound which requires a trip to the hospital to remove all the spray material. It’s not something you want to go through, so please don’t buy anything you’re not skilled or strong enough to handle! You can always upgrade later on. HVLP’s use a turbine module instead of a pump to spray paint. They’re the latest technology on the block when it comes to paint spraying, and until recently, they were too expensive for most users to afford. Now, they’re increasingly competitive and versatile. They run much quieter than airless systems, and they provide more accurate spray patterns with less wasteful/messy overspray. While airless systems can often run at dangerous noise levels, many HVLP units are closer to the noise level of a vacuum, and some quiet models are only as loud as a normal conversation. HVLP’s are also much more accurate, since they produce a clean, precise spray pattern with little overspray. That makes for a neater work environment, and it also saves you money on coating materials since more of what you buy will actually make it onto your project surface. Most HVLP’s don’t do as well with un-thinned latex paints as airless systems, but the more powerful options can rival airless sprayers on any coatings. Where HVLP’s really excel is in finish work and higher-end coatings, such as auto paint, clear coats, and furniture work. They can give you a flawless, glass-like lacquer which would be impossible to achieve with an airless sprayer or most compressor guns. When you’re shopping for HVLP units, you need to pay close attention to the power rating on the turbine. For latex paints and projects where you need lots of coverage, you can assume that the more power, the better! However that’s not the case for fine work, like finish coats on cars. If you’re going to need to do both, you want to look at an HVLP unit with variable power and speed. They’re expensive, but they can be a better deal in the long run because they’re so versatile. Which type of spray system should you choose? If what you’re painting all falls under the category of coverage work (mostly walls, decks, and other big surfaces), choose an airless sprayer. If you’re painting a mix of furniture projects, auto parts, and coverage tasks, you should choose a more versatile HVLP spray system. There’s a lot of options even in one individual category, and there are HVLP’s and airless systems for all sorts of needs and budgets. We’ve taken care to make smart choices for all our smaller guides, so you can find exactly the right model for your paint and finish work! Check those specific guides out below! 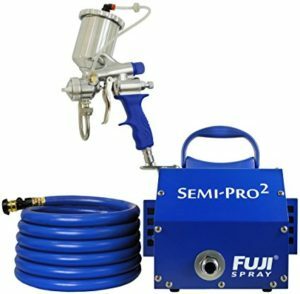 If you’re buying a complete spray system, or a gun to use with an air compressor, you’re going to find that there’s a whole range of options within each type of paint sprayer. There are lots of factors you’ll need to take into account when you decide which is best for you, like ergonomics, portability, and specific features. However, your main decision will come down to choosing the right combination of pump and gun. It’s mostly a matter of size and power. The combination you need is largely dependent on the type of paints and coatings you want to use your system for. Thick coatings like latex need a big tip, and a higher psi/power rating from the pump unit. That’s true no matter which type of sprayer you’re using. Latex in particular needs to be paired with a powerful enough pump to keep clogs away, and a large enough tip to flow cleanly (usually 1.8mm or larger, depending on how much you thin it). Meanwhile, acrylics, lacquers, stains and varnishes require less power, and are best sprayed through a smaller tip. While you can spray them at high powers, they tend to bounce back. So, if you’re buying a system that’s powerful enough to spray latexes, simply make sure there’s a way to turn down the gun and/or the sprayer unit to make sure you can cater appropriately to both types of coating. No matter which materials you’re working with, a few simple rules also apply: remember that larger projects need more power, and nozzles with wider spray patterns. Smaller projects and objects with tight spaces are easier to work on with a detail gun and a lower power setting. It’s also important to consider that you can nearly always turn down a larger pump for thinner coatings. You can also swap out the tip of your gun for something narrower when you’re working with a thinner, finer material. You can’t turn up a smaller pump to shoot latex. So, shop based on the thickest, toughest coatings you want to spray. That’ll determine how powerful you need your setup to be. Then, work backwards and figure out whether you need a powerful model with speed/flow adjustments, or whether you can spray all your coatings at high levels. We’ll talk through the specifics of which coatings you can spray with each system, and what additional tips or features you’ll need to do so in our reviews. When you’re looking at the supply component of your spray system, you should look for specs that measure its paint/finish output. That’s measured in GPM (gallons per minute, reflecting how much paint you’ll put down), PSI (pounds per square inch, measuring how hard your paint or finish will be hitting the surface), or CFM (cubic feet per minute, a measure of the air output from a compressor, and a measure of how much air a spray gun will draw). To compare HVLP and airless systems, focus on the GPM and PSI. To compare air compressor/gun setups, look at the PSI and CFM. We go into detail about CFM ratings in our guide to air compressors. Here, we’ll just say that most guns are rated at around 2 CFM, give or take a CFM either end depending on the gun. If you’re shopping to fit a compressor you already own, remember that paint guns are a 100% duty cycle tool, so you should be using compressors with at least 6-8 CFM at 40 psi for a typical gun. Motors and pumps on airless and HVLP systems are pretty easy to assess, since they typically have a HP rating and a listed max output pressure. The higher the better, in both departments! The more power you have behind your gun, the more finely paint will atomize. However, having a super powerful system is only necessary if you’re going to spray thick latex paints, especially exterior latex paints. In some cases, fine finish work will require you to be able to turn down the output, which is why we don’t recommend airless sprayers for those applications. Start by finding a gun that’s ergonomic, user-friendly, and durable. Most DIYer guns cost around $50-$150, and professional-grade guns usually cost between $150-$500+.It’s obviously more convenient to buy something that’s both high-quality and suitable for your projects out of the box. So, once you’ve found an appropriate pricepoint, look at the specific tip options and feed options on the gun itself. You’ll find that most have several variations available, especially the more expensive models. However, if you’ve found a complete system with a great spray unit and a high-quality gun, you shouldn’t let the tip size stop you from buying it. As long as you’ll get at least some use from the standard tip, it’s worth your money to grab the system and simply buy an extra tip for the coatings that need something different. Spray systems usually come with an all-purpose tip on the gun, and they’re quite good at general paintwork.Most painters will end up buying a few alternate tips at some point anyway. The more tips you have, the more versatile your system becomes, and the more precisely it can spray each type of coating. The most common spec you’ll see refers to the size of the opening, e.g. .015 (a common tip size for latex paint sprayers). A tip listed at .015 means that the opening is .015 inches wide. The other common spec refers to the width of the spray pattern, which is the size of the fan you use to paint with. Widths usually run between 6” to an upper threshold around 14”. The width is much less finicky to get right than the tip opening size, since you simply need to gauge how much coverage you want for your project. Think of this like choosing a paint brush! For a bigger surface, like a wall or a ceiling, you want a wide fan to get that area covered more efficiently. If you’re doing detail work, or spraying something like a bannister, you want a smaller fan to make less of a mess. Or, you might see both specs listed together! That’s the handiest way to gauge a nozzle, since you can see everything you need in one place. Using the same example tip, a nozzle with an opening of .015” and a spray pattern width of 5” will be listed as a 515 tip. We suggest figuring out the proper tip size first, then choosing between spray patterns. Most good guns allow you to swap tips and make pattern adjustments as needed. We recommend that every painter have one good general-purpose tip (usually the factory set, around 1.5 mm to 1.7mm) and then either a smaller or larger tip depending on the coatings you work with. As long as you’re buying durable brass tips, there’s no reason not to invest in a few different sizes to expand your capabilities! Pro Tip: one easy way to tell that your tip is getting clogged is if you have a stronger pressure but are covering less ground. That’s a sign you need to either clean or replace your spray tip. A lot of your decision regarding which paint sprayer to buy will come down to price. Handheld machines are the least expensive way to go, and they’re the most affordable way to get spraying quickly. They’re a very sensible choice for DIYers and homeowners who have a few projects in mind, but aren’t planning anything on a large scale or requiring professional results. Handhelds cost around $50-$200 for most models. Full-size, complete “system” models, whether they’re airless or HVLP, tend to be the middle price option, although the nicest pro-grade models can be as expensive as any compressor and gun combo. Plan to spend anywhere from $300-$3000 for a full system, depending on the power ratings, precision, and build quality. In most cases, the most expensive option for paint spraying is to buy a compressor and gun system. That’s because the compressors required for paintwork can be very expensive on their own. You need something a lot more powerful than your average pancake compressor, so you’ll usually be looking at $500+ minimum for the compressor, at the very least. You could end up spending as much as $2000 for a very powerful, reliable compressor. Guns for these systems usually cost from $50-$500. So, as you can see, unless you’re able to use a compressor that you already own, costs can add up quickly. On the other hand, if you use a range of air tools, a good compressor can hold a lot of value across your tool kit. If you’re looking at a complete system that includes a pump or turbine, always check the rated annual usage (listed by gallons per year or month). You can gauge how much you need to spend by weighing your spraying requirements against the amount of gallons a machine is recommended for in a given year, as well as by deciding on your power and accuracy needs. In terms of guns, more money gets you a more efficient, accurate, and consistent spray. It’ll also buy you something with a more ergonomic and user-friendly design that’s more enjoyable to use for long periods of time. Cheaper guns are usually heavier in the hand, more awkward to use and less efficient. They’ll produce more overspray, and a less finely atomized finish. While there’s certainly a difference in overall quality as you go up the price ladder, the fluid tip and spray cap are where you really want to invest your money. The most expensive spray guns have the most precisely machined tips, which is what makes the most difference in your results. That precise machining results in a gun that sprays uniformly every time, without you having to fiddle. It’s often a good idea to have a few tips on hand, whether you’re working from a pump set or an air compressor. You should have one for thick things like latex, one for precision finishes like varnish or clear coat on cars, and one general purpose tip (usually the one that comes with your gun). Be sure to figure those extra tips into your budget calculations! So, let’s get down to brass tacks: how much should you be spending? You don’t want to make a mess of your project with stray paint, and all that overspray is wasting expensive coating materials. (Read here for tips on limiting overspray) So, you want to make sure your sprayer setup produces an even, contained fan. In general, that requires a finely-machined spray tip, and the ability to make adjustments from the gun. Look for something that doesn’t produce foggy edges or lots of overspray. Non-bleed tips are especially good, but you’ll only find them on more expensive guns. Another way to cut down on overspray and come out with a precise fan is to have a system with lots of fine-tuning in both the spray gun and the supply component. A lot of cheaper systems can only be adjusted from the gun. Being able to adjust from both ends helps you find a better sweet spot, and do so more quickly. The best needle and tip sets are made of brass, and it goes without saying that stainless steel structural parts are the best choice for any tool. So, look for metal frames, rugged casing, and solid metal sprayer and tip components. Since the tip is the number one component in determining your results, make sure you buy a gun with a good one! The best are removable for cleaning, and easy to replace. Reversible tips are easiest to free of clogs, so we especially recommend those for airless systems and latex paints. You should expect any good-quality sprayer to have interchangeable tips. That gives you more versatility, and precision with a wider range of coatings. You want to be able to make quick, intuitive, and accurate adjustments as you work. You shouldn’t need any tools or to do anything complicated to make a quick change mid-spray. You also don’t want your spray to go out of whack as you work. So, look for machined metal knobs on the gun, the spray system, or both. Expect adjustments on the gun for both pressure and spray pattern. Of course, it’s even better to adjust pressure on the unit itself, so ideally a system will accommodate for adjustments at both ends. However, that’s not usually possible when you’re using an air compressor. When you’re looking at specs, one thing a lot of people forget to check on is the noise level that a sprayer will produce. It’s important to think of ear safety, as well as noise’s impact on others nearby, since these can be quite loud tools. Airless sprayers in particular are very loud. For shop work in close quarters, HVLP’s or compressor setups are generally the better choice. Hand units are also relatively quiet, but that’s mainly a result of their small size. Since air compressors use a similar pump to the one you’d find in an airless system, they also tend to be very loud when you use them to paint. If you’re on a job site where noise doesn’t matter, or where you simply need the power and coverage, go airless. However, you should be prepared to wear lots of ear protection. Last of all, make sure to think about durability and reliability. 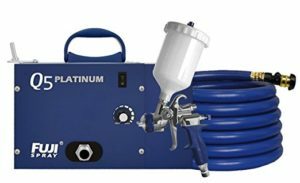 Paint sprayers are finicky tools at their best, so you want to make sure you’re getting a reliable, well-designed machine that can run for years without issues. We recommend looking for machines that are built in the USA or Europe. They have better quality control on the motors, and higher-end spray tips that simply work better. Handhelds are the only type of sprayer where you might consider an imported model. Look for brass spray tips, and all-metal construction on any gun over $250. With the exception of cosmetic casing or tires, there should be no plastic parts! Nylon paint cups are acceptable since they’re not shatterproof, and they’re lighter than steel. Check for warranty coverage on any system, and always extend it. Paint sprayer warranties rarely go beyond 2 years, so if you can double that at the checkout, it’s a solid investment. We also suggest having a look around to see what replacement parts are available, and how much they cost. To figure out what kind of working life you can expect from your new paint sprayer, the key thing to look for is the annual usage rating in gallons. Most durability issues come from people overtaxing their system, so it’s important to know whether a machine fits your usage needs before you buy. Here on our home page, we’ve simply recommended our favorite all-purpose paint sprayers. You can use them for a range of projects, and they perform admirably with lots of different coatings and surfaces. With that said, we know that many of you will have some specific projects and applications in mind as you’re shopping. So, we’ve put together a few specific guide to help you find exactly what you’re looking for! Check them out! Spraying cars is a tricky business, no doubt about it! For one thing, you’re usually looking at three different coatings materials for one project: a primer, color coat, and clear coat. For another, cars are one type of project where even the slightest flaws will show up very obviously. We’ve put together a guide full of different gun and set options for auto work! This is a highly refined and accurate gun for smaller work, like individual panels or spot repairs. It’s made in the UK, where you can expect better quality control and reliability than from an Asian-made tool. The tip has fantastic atomization of any car paints and finishes, which gives you a super smooth finish without any visible grain. The fan pattern is also ideal for auto and bike bodies, since you can adjust the width to anything between 1/4” to 9”. The DeVilbiss also has a clever balanced air valve built in, which gives you smooth triggering and control to make subtle blends and fades without that kick you feel on a standard gun. Even the needle is self-adjusting! 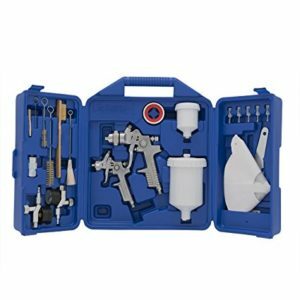 The kit comes with both HVLP and air caps, as well as all sorts of other accessories and tools, even wrenches and lubes. It’s everything you need for detail work–just supply the air compressor or pump! Check out the full review of the DeVilbiss, and see our other choices for spraying cars here! Our take on the cordless paint sprayer is that it’s a great idea whose time hasn’t quite arrived yet. What do we mean? Well, who wouldn’t want to be able to do small jobs with a convenient, cordless hand gun? That’s right, nobody. A cordless paint sprayer is the ideal tool for small shops, or for little projects around the house. Sadly, only a few companies have invested the R&D time and money into developing really good cordless models, so the selection is pretty sparse. While there are some good-looking models out there, they’re not very reliable tools for regular use. Most are also prohibitively expensive for what you get. We’re crossing our fingers that the market for cordless units continues to grow and improve, because we’d love to see these gadgets come into their full potential! Aside from a few discontinued Ryobi models, Graco’s TrueCoat cordless models are the only cordless options on the market right now. This is the top-shelf version. It’s the only cordless model that’s accurate and steady enough for spraying finishes. It sprays anything from lacquer to enamels and heavy latex paints, without any thinning. You can also use it for solvent-base coatings, including “hot” solvent materials. It has a lot of the features you’d expect from a top-notch sprayer, too, like a fully adjustable pressure knob, which locks in place to keep your setting. There’s also a full set of accessories, a spare battery, a charger, and storage case. The cordless battery system gives you a little over an hour of painting time on each charge, and the whole thing is covered by a 1-year warranty. Read our full take on the True Coat Pro, and learn why we think that even the best cordless model doesn’t quite live up to the hype in our cordless guide! Furniture projects demand a lot of accuracy. Furniture is full of tight spaces, sharp corners, uneven surfaces, and decorative texture. That’s a tall order for most paint sprayers to handle. And with something like a cabinet, which you’ll be interacting closely with on a daily basis, you really need a sprayer that can give you a smooth, flawless finish. Furniture is also like cars, in that you’ll generally be spraying several different types of coating onto any given piece. We’ve put together a range of recommendations to suit any needs from basic crafting to full-time shop work! This Fuji system is marketed as a “semi-pro” model, but we think it’s professional enough for most full-timers! The best part is that it’s inexpensive enough for DIYers to afford! We love the gravity-fed HVLP system on this Fuji. It sprays very cleanly with relatively minimal thinning, even using latex paints. The motor is also a standout feature. It’s a 2-stage motor, which you can’t usually find on machines this inexpensive. 2-stage motors give you the grunt power you really need to atomize thicker coatings at a good spray pressure. It also has lots of adjustments onboard, so you can tailor the system to the furniture piece and specific coating you’re working with. 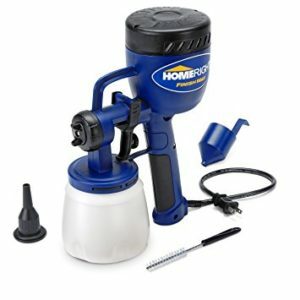 This model has a lot to offer ambitious DIYers or pros on a tight budget, since it has a fully-adjustable fan control knob, non-bleed spray, and extremely durable construction! Read all our thoughts on the Fuji, and compare it to our other recommendations for working on furniture pieces here! When you’re painting indoors, a little noise can create a lot of headaches. Likewise, while you can get away with a lot of overspray on outdoor jobs, it adds up to a huge mess indoors. So, we’ve looked specifically for spray systems that give you quiet, neat performance indoors! Our guide has a range of options for different projects and skill levels– have a look! This system is pricey, but it’s worth its weight in gold when it comes to noise. The Q3 has noise dampening features all over its frame. The body of the pump box is noise-insulated, and there’s a proprietary “heat dissipation box” feature inside. In layman’s terms, what it does is dissipate heat from the turbine quickly and easily, so that the operating temperature stays cooler. That protects the motor and keeps your machine running longer, but it’s completely silent. Compared to a fan-cooled system, the Q3 is much, much quieter. This machine is actually the quietest 3-stage turbine system on the market right now! Fuji have tested it to produce about 50% the noise level of competing sprayer systems. The whole thing is super heavy duty, and we think it’s one of the best all-purpose indoor systems you can buy! Check out the full, in-depth review in our guide to the best indoor paint sprayers! You can also see how the Q3 stacks up against our other picks! As the name suggests, HVLP (or, High Volume, Low Pressure) sprayers are popular because they put a high volume of paint onto your target area with a low amount of pressure. That cuts down on overspray and spatter significantly, and gives you a smoother, cleaner pattern. They’re also much quieter than a big airless sprayer pump, so they’re a lot more enjoyable to use on a regular basis (especially inside!). HVLP units have been on the market for a while now, but they’ve recently become affordable for DIYers as well as full-time professionals! To help you get a sense of all the options out there right now, we came up with a special guide just for HVLP models! It comes in a range of tip sizes, from 1.0mm to 2.0mm. So, you can spray pretty much any coatings out of this using an HVLP pump or air compressor (with an appropriate amount of thinning). It’s only about a pound, which makes it light on your wrist and shoulder. Still, it’s made ruggedly, with all-metal parts and an aluminum cup. It can lay down finishes like glass, and it’s super easy to clean after you’re done. You’d want a bigger tip than this gun can offer for thick latex paints, but with the exception of those, it does a great job on just about everything. We love that it has a pressure adjustment knob right at the bottom of the handle, for customizing the gun to your specific project. The Graco-Sharpe performs way above its price range, so it’s a great choice for DIYers who want pro-grade finishes but can’t justify the cost of a DeVilbiss or an Iwata. Since it’s a relatively thin coating material, lacquer doesn’t require nearly as much power to spray as latex paints and other thicker coatings. That’s why you can get a fantastic DIY lacquer finish using an inexpensive handheld sprayer! Of course, when it comes to professional-grade work, you’ll need some extra grunt power to achieve a perfect, glasslike finish. There are a lot of different options out there for lacquer, but we’ll help you figure out exactly which tool is the best choice for you in our special guide! This PaintWIZ handheld unit is one of the worst on the market for latex paints. But it somehow manages to perform great with lacquer finishes! So, while it’s not a great all-purpose sprayer, it’s a very affordable and respectable choice for laying down clear coats and thinner coatings on furniture or craft projects. 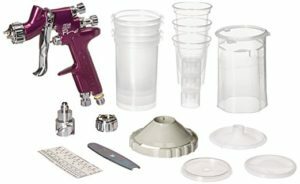 The PaintWIZ is available for well under $50, and it’s everything a crafter or casual DIYer could want for small projects. It’s easy to clean, easy to set up, and lightweight and intuitive to use. It has an adjustable air cap which gives you three different spray patterns, and it has a fan adjustment from a full foot to under an inch of coverage. The real highlight: even though it’s so inexpensive, it’s covered by a 1-year warranty. That’s on a machine coming from a real painting company (Fuji), and it’s something you won’t find on other cheap. See our complete, comprehensive review of the PaintWIZ in our guide to the best paint sprayers for lacquer! 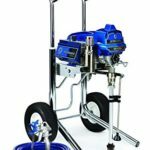 While air compressors are a bit less technical a tool to shop for than a paint sprayer, they’re tricky to navigate when you need to do painting. For a start, most compressors are rated at 25% duty cycles, which means they’re rated for tools that use only 15 seconds of air every minute (or an equivalent ratio). That’s how a nail gun works, but that’s not how paint guns work! Painting is a constant air draw, so you need to think about your compressor in terms of 100% duty cycle. So, if you’re shopping for a compressor that can power a 2 CFM spray gun, you’ll have to buy something rated to 8 CFM in most cases. That’s just the tip of the iceberg, once you consider things like motor stages, duty cycles, and tank capacities. If it all seems bewildering, don’t worry! We’ll get you spraying in no time with our guide to the best air compressors for painting! This North Star unit is perfect for people painting cars, furniture, or anything else in a shop setting. While the stationary design means you’d need a long hose to reach into or outside of a building, for wall painting, it’s ideal for people who bring their projects into the shop to coat. It has more than enough power (12.5 CFM at 40 psi ) to handle even the biggest spray guns, and a big tank which cuts down on the cycles the compressor has to run to keep up. North Star compressors are some of our favorites for painting because they have such industrial, powerful builds! This thing is loaded with a full 3 HP motor, at a price point where others are woefully underpowered. And while the weight of the machine means you would be hard-pressed to move it around, it’s pretty close to indestructible. The North Star also has lots of smart design tweaks to help it run cooler and last longer! It’s a great all-around shop workhorse, which is ideal for sanding, nailing and grinding as well as painting. 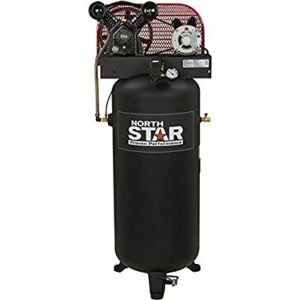 Check out our full review, and compare the North Star to the rest of our recommendations for air compressors here!